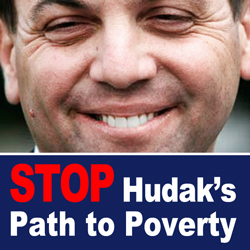 Toronto – May 8, 2013 – Tim Hudak and the Conservatives in Ontario are up to their old tricks again by introducing another round of attack bills that will further undermine fairness, rights and living standards for 99 percent of the province’s population. On May 1, the Hudak Conservatives introduced three attack bills that if passed will weaken the collective strength of workers, and the ability of unions to effectively bargain for better working conditions and healthier, stronger communities. This latest attack by Hudak is central to the Ontario Conservative agenda called “Pathways to Prosperity”, which is based on the bankrupt ideas of Hudak’s mentor – Mike Harris – and will only increase the already tremendous gap that currently exists between the super-rich and the rest of us. Public Members Bill 62 stipulates that even if a union has filed with the Ontario Labour Relations Board (OLRB) to serve as the official bargaining agent for a group of employees, and even if their employer recognizes the union as the bargaining agent, the OLRB would no longer have the ability to grant automatic certification and would be forced to hold a vote. Not only would this law be a waste of time for the workers, their union, their employer, and the OLRB, it would also waste taxpayer money by forcing the OLRB to spend resources on conducting a vote that none of the parties want. With Bill 63, Hudak and his labour critic Randy Hillier are attempting to weaken the OLRB by taking away the ability of the Board to determine its rules and procedures and allocating this responsibility to the government of the day. .
Bill 64 takes a page right out of Government Boss Stephen Harper’s playbook. Like Harper's Bill C-377, Bill 64 would make it mandatory for unions to provide the Minister of Labour with a financial statement for expenses of $5000 or more. Unions already provide financial information to members at union meetings and by request, and publishing the expenses paid to a law firm for a members' legal dispute would undoubtedly violate solicitor-client privilege. Finally, Bill 64 would allow for workers to opt out of paying union dues in a unionized workplace. Hillier claims that workers who opt out of paying union dues would be removed from the collective bargaining agreement to ensure that they do not receive the agreement's benefits without paying for them. But the wording of this proposed legislation is wide open to interpretation. If a wage rate negotiated for members through collective bargaining became the prevailing wage in the workplace, would this mean that workers who opted out of paying union dues would make the prevailing wage? If a two-tier wage scale was implemented where non-union workers were paid a lower wage, would that drive down wages for unionized workers by pressuring them to accept lower wages or lose their jobs? Hudak and Hillier call Bill 64 "The Defending Employees’ Rights Act," but this name is a misnomer. It should be called the "Taking Away the Rights of Employees Act," as it would do nothing to improve the rights of workers and would weaken the security that employees enjoy in a unionized workplace. Taken together, the three bills would widen the income inequality gap in Ontario and create unstable labour relations in the province. The bills are completely unnecessary and further prove why working Ontarians must prevent "Tea Party Tim" and the Progressive Conservatives from ever forming a government.